Day # 4 was another play-it-by-ear day. Since we hadn’t been over to Disneyland (the Magic Kingdom part) yet, that was what we aimed for. I let #1 Son sleep in again, while I drank coffee, read the paper, and finished the Faye Kellerman novel I’d picked up a few days before. And #1 Son slept, and slept, and slept. I finally woke him up and said, let’s go! It’s something of a tradition in our family that we ride Pirates Of The Caribbean just before lunch, and then eat at The Blue Bayou. We barely made it for the last seating for lunch. But we did make it, so the tradition holds. We grabbed a cold drink and checked the map to see what we wanted to do next. And then realized that there wasn’t anything else either of us was just dying to see. We were even done souvenir shopping. We were both ready to go home. Mom’s take on Disneyland: Because this is, after all, Disneyland. But minus one because of the number of attractions that were closed. Even the Castle was wrapped up in plastic. We rode the Monorail back to Downtown Disney, where I hit the bookstore for reading material. It was still early and neither of us was hungry. There’s a movie theater in Downtown Disney, so we decided to see Collateral with Tom Cruise and Jamie Foxx. Mom’s take on Collateral: Lots of fun. Chills. Thrills. A bit too graphically violent. But definitely tense. After the movie we still weren’t hungry, but #1 Son wanted a last slice of Key Lime Pie. We wandered over to House Of Blues to feed his jones. And then we headed back to the room. To tell the truth, we were both ready to come home. At the room we found a nice surprise! We had “made” a punk teddy bear (actually, a bunny) at Build A Bear Workshop in Downtown Disney. 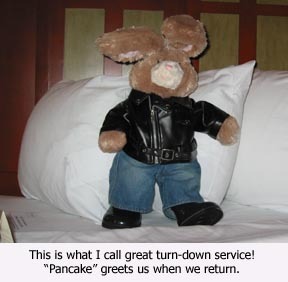 Our turn-down-service person had posed it on #1 Son’s bed. That was a fun treat. The next morning, we needed to be outside at 6:15 AM to catch the shuttle to the airport. (Blech, what a terrible time!) I asked for a wake-up call, and this time we actually got it! (Does it have to be Mickey calling? Yeah. I guess it does. This is Disney.) I’d se the alarm, too, just in case. It was too early for room-service breakfast. But we drank coffee and packed. I’ve already blogged about the bullet-belt fiasco at the airport. I was glad to be home. The fur-kids were glad to see me, too. All of them had lost weight at the Cat B&B. It’s not a big deal for Phoebe and Moo Cow, but it’s a little bit of a worry for Kidd. He’s made up for lost time since we’ve been back, though. And that was how I spent my summer vacation!